The world of wetsuits can be a tricky one to get your head around, especially if you’re new to the game. So to save you time and effort (and a headache), we’ve compiled a list of the best entry-level wetsuit ranges from the best brands out there. For full guidance on the wetsuit thickness you should be wearing, check out our Wetsuit Thickness Guide. Alternatively, our blog on Wetsuit Quality and Price Differences will give you the lowdown on different wetsuit features, so you can identify the ones that are important to you when buying your first suit. First off, here's a table summary of the best beginner ranges for Men and Women by brand. Even if you’re new to surfing, you’re probably familiar with Billabong. The Men’s Intruder and Women’s Launch range go hand-in-hand as great wetsuits for those who want to have a go at any kind of water sport, or simply stay protected from UV rays at the beach. With incredible value for money, the suits come with back zips and a flatlock construction, and offer all the basics you’ll be looking for in a first suit. For a slightly more advanced suit, try the Men’s Absolute and Women’s Synergy range. The updated suits are available in either flatlock or GBS seams and use thermal lining and a wind-resistant mesh throughout for optimum warmth, so if you’re prone to feeling the cold, these ranges are for you. These ranges are a little pricier than the Intruder and Launch, but are built to be even more light, flexible and durable. An ideal first suit if you want to take surfing (or any water sport) that bit more seriously. Rip Curl’s Omega range for both men and women offers a top quality wetsuit at an economical price. Understandable, given that Rip Curl has produced some of the world’s most technologically advanced wetsuits (one word: Heatseeker), and support some of the best surfers out there – Mick Fanning and Gabriel Medina to name a couple. Boasting some of the best neoprene with Ultralite and Freeflex features throughout, Omega certainly does not disappoint. Quiksilver and Roxy have some of the Championship Tour’s best surfers under their belt, but they don’t stop short of offering novice groms the greatest suits for their money either. Entry-level ranges for both brands also come in junior sizes. The Quiksilver Prologue and Roxy Prologue Series feature super-stretch neoprene which is made from limestone derivatives and built to last. All wetsuits use flatlock stitching and a back zip entry system. The range is built to be lightweight and flexible. The Quiksilver Syncro and Roxy Syncro Series are also made from air cell-rich limestone for lightweight warmth. Thermal back panels offer wind and water repellency, and the wetsuit’s lining transfers body heat into infrared energy to generate warmth – keeping you extra toasty. Syncro Series suits are available with either back or front zip entry systems, and use either GBS or flatlock stitched seams with drainage holes. As the founder of the first wetsuit back in the ‘50s, O’Neill were inevitably going to be at the forefront of high-performance surf gear for all abilities. The Reactor Series is everything you could possibly want in an entry-level suit, and at incredible value. All suits have smooth chest panels for extra warmth and wind protection. O’Neill’s exclusive FluidFlex neoprene offers great stretch, and the range is ideal for pretty much any water sport – a perfect all-rounder. Last but not least, Mystic may be new to the game but their latest range of wetsuits for 2019 certainly prove they’re no less worthy of a mention than any other brand. The Brand Series range consists of all 3/2mm wetsuits equipped with back-zip entry and 4-way stretch kneepads for protection and durability. Flatlock stitching is used on each suit, meaning that panels have been constructed with a slight overlap and a wide switch. This creates a very strong connection and makes the seam comfortable against the skin. The Star Series takes features from the Brand Series (e.g. 4-way stretch kneepads) and adds extra elements to focus on keeping you warm in the water. Polar lining on the chest and back keeps your core extra toasty, and seams are Glued and Blind-Stitched (GBS) which makes them extra watertight, so there’s no chance of any cold water seeping through. This collection is available in toddler and junior sizes. 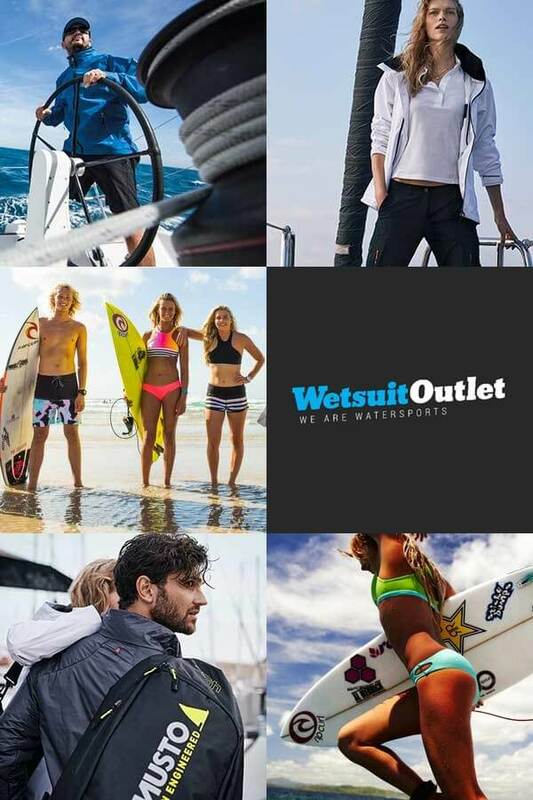 Click here to shop our full range of wetsuits. Join the community! Follow us on Facebook or Instagram.